A tool for making a four-page zine. You don't get to write or draw though. Hypothetically you could take the images from the screenshot-folder and add that content if you are especially motivated. Enjoy! //WARNING: Don't resize the window after you pick your resolution. The game locks up when the scene changes and your zine does't get saved in the screenshots folder. I'm not sure how to solve it yet. 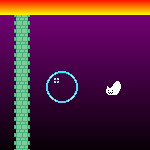 A Pac-Man remake I made for a friend of mine. This link is to a Flash version of the game. EDIT: did one teeny-tiny update to provide a subtle patterned background for the game screens (not seen in the screen shots, which I'm too lazy to update). It looked a bit too empty without it.